Early in 1862, Union Gen. Ambrose E. Burnside led an expedition to secure the coast of North Carolina and occupy strategically important sites such as New Bern and Elizabeth City. After Burnside learned of the March 9 clash between USS Monitor and CSS Virginia (formerly Merrimack) in Hampton Roads, Virginia, he became concerned that Confederate ironclads might attack his right flank from Virginia via the Dismal Swamp Canal. He decided to destroy these locks and close the canal here. Burnside assigned Gen. Jesse L. Reno the task, and before dawn on April 19, Reno led a four-gun battery and more than 3,000 men north from Elizabeth City. withdrew to Joy’s Creek to await reinforcements and more ammunition. The Federals bivouacked on the field but marched back to Elizabeth City during the night when rumors of a counterattack reached Reno. 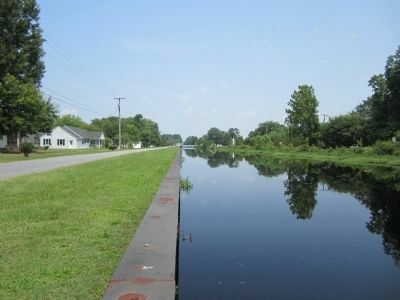 The canal remained intact, the Confederates lost only 28 killed and wounded, and the Federals suffered 127 casualties. Reno’s claims to the contrary, South Mills was clearly a Southern victory, but no Confederate ironclads ever used the canal and no serious threat was ever mounted to Burnside’s flank from this direction. Location. 36° 26.492′ N, 76° 19.518′ W. Marker is in South Mills, North Carolina, in Camden County. Marker is on Canal Drive 0.3 miles south of Main Street (U.S. 17), on the left when traveling south. Touch for map. Marker is in this post office area: South Mills NC 27976, United States of America. Touch for directions. miles away in Virginia); Moycock (approx. 10.2 miles away); Dividing Line (approx. 10½ miles away); First School (approx. 11.2 miles away); W. O. Saunders (approx. 11.3 miles away). 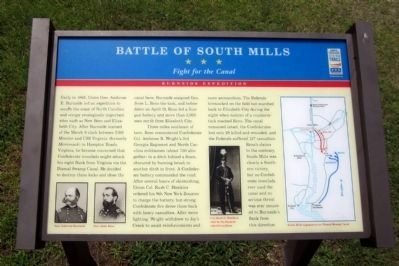 Touch for a list and map of all markers in South Mills. More about this marker. On the lower left are portraits of "Gen. Ambrose Burnside" and "Gen. Jesse Reno"
In the center is a photograph with the caption, "Col. Rush C. Hawkins, clad in the Zouaves’ colorful uniform." 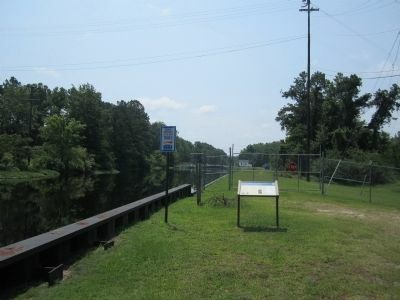 On the right is a map of the "South Mills engagement on Dismal Swamp Canal"
Credits. This page was last revised on June 16, 2016. This page originally submitted on June 25, 2012, by Bernard Fisher of Mechanicsville, Virginia. This page has been viewed 649 times since then and 22 times this year. Photos: 1, 2, 3. submitted on June 25, 2012, by Bernard Fisher of Mechanicsville, Virginia.